How did evolution move itself forward? It's not as complicated as you might think. Where did life come from? Following the theory of abiogenesis, scientists propose life may have begun from nonliving matter. But how this process actually occurred is subject to much scientific debate. 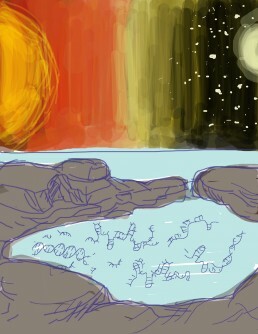 A popular model anchored on abiogenesis is the “primordial soup” concept. It proposes that organic matter once present on Earth was exposed to energy, prompting chemical reactions that – after hundreds of millions of years – evolved to become the enzymes indispensible to the current genetic code. The ingredients of this gene soup are simple: mix rain with common molecules and sunshine, let it cool in the evening, and add thickener. The thickener is apparently the key, according to researchers from the Georgia Institute of Technology. They believe this specific ingredient may have been the catalyst needed for gene-like strands to replicate themselves in puddles billions of years ago, when Earth was still devoid of life. To test this theory, Christine He and Isaac Gallego, the researchers behind this study, experimented by adding an off-the-shelf viscous solvent to serve as the thickener. Their findings point towards a straightforward answer to how precursors to today’s genetic code were able to copy themselves before enzymes that are necessary to the process even existed. The answer may seem deceptively easy, but researchers assert that being “easy” makes it a more feasible solution. The same reaction could have actually happened in a messy puddle billions of years ago; and with additional research, it may eventually provide an explanation of how life began on Earth. “A simple and robust process like this one could have operated in a variety of environments and concentrations making it more realistic in moving evolution forward,” said Martha Grover, a professor at Georgia Tech’s School of Chemical and Biomolecular Engineering who oversaw the research.